Autumn is definitely in full swing. This a twisted maple in my yard. Isn’t that a gorgeous color. This is a watercolor mini I did awhile back. I watched an interesting show on “60 Minutes” this week about Van Gogh. I’m sure most people have heard by now that there’s a theory that he did not commit suicide but was accidentally shot. It reminds me of the theory that Gauguin actually cut off Van Gogh’s ear (which is more probable than not, Gauguin was there, he and Van Gogh were fighting , Gauguin was swinging around a sword but he claimed he left before Van Gogh cut himself.) Of course the curators at the Van Gogh museum get in a huff anytime someone mentions that Van Gogh might not have been altogether an insane depressed madman. It just gets them in a right tizzy. Here’s my ode to Van Gogh. Acrylic, 2.5 inches by 3.5 inches. 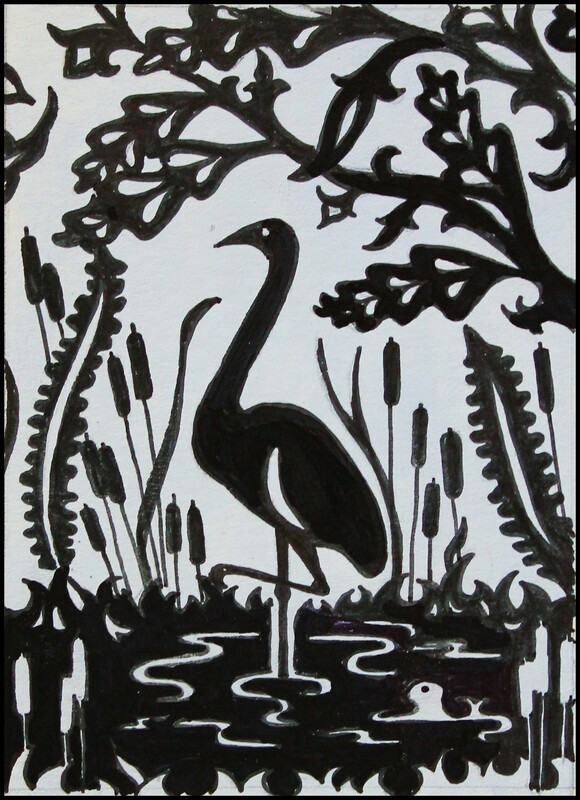 I used to do paper-cutting in the traditional style of Scherenschnitte. I still do occasionally but this time I was lazy and used ink. 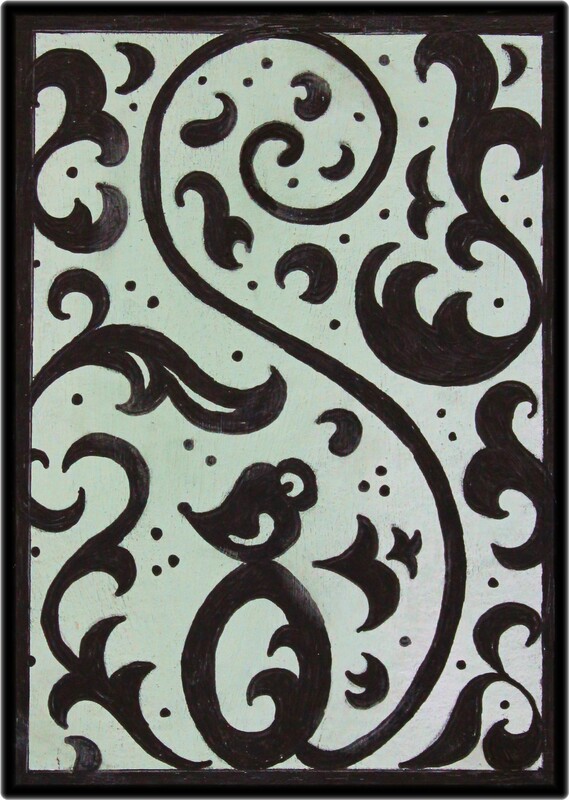 Both are ink on acrylic, 2.5 by 3.5 inches. 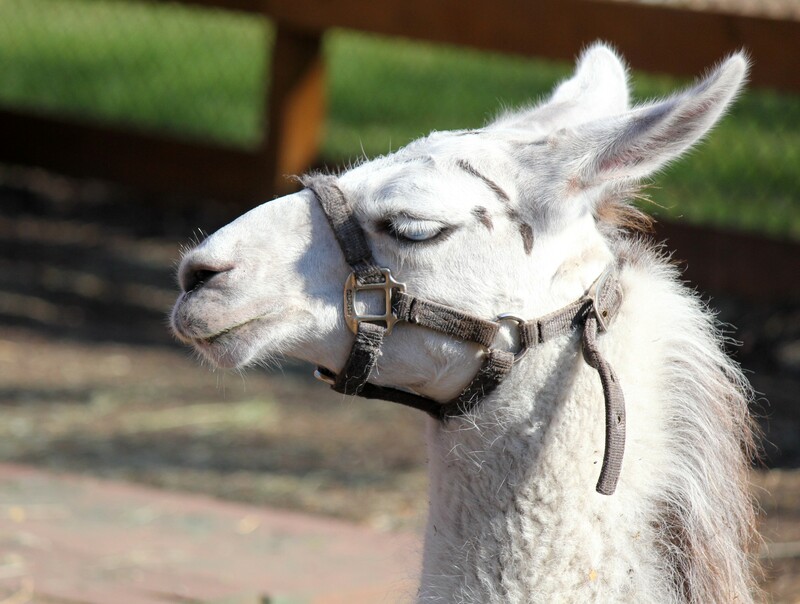 And here’s a photo of a llama meditating. Van Gogh should have tried that. It’s very relaxing. My spell check does not recognize “Van Gogh”. Seriously. I like Van Gogh too and came to the same conclusion about him, You mimic his strokes well. I never had the patience. I have copied Fernando Boterro, however. Did you ever hear that Van Gogh was autistic? That was about 3 years ago but I think that’s what he was tagged with because it’s the ‘in’ terminology being used today. I think you’re right. Autistism doesn’t fit his sociability. He had a great many friends, and the locals who lived around him liked him very much. He had a couple of STD’s for which there was no treatment at the time. That had to be very painful for him, then he drank as well so it’s no wonder he behaved erratically at times. Boterro is great, there’s one that’s a circus that I really like. And his chubby little people. Love his style. 🙂 I’m with you. I love Autumn but I don’t like being cold! I love the leaf, Virginia. The colours are so pretty. As for Van Gogh, I remember an art lecture we had in college, the paint used way back then was lead based, so whatever was wrong with Vinnie that couldn’t have helped his already medical or mental situation. Nice to have you back blogging. I,too enjoyed the 60 minute segment about our beloved Van Gogh. of Vincent’s painting of the cat was great. Our colors here in the mts of MD are turning colors that are breathtaking. I need to collect some leaves to paint. Thanks for your blog. Thank you for the encouragement, I appreciate it! I can imagine the leaves there, we lived in Northern NY for a few years when my husband was stationed up at Fort Drum. The colors in the cool New England climate are amazing. You’re lucky to be up there! These are great! What a joy to open your email thisd morning! Thank you, I love your blog, your pastels are wonderful! Thank you. That’s wonderful compliment from a pro like yourself. Everyone, if you like photography check out Munchow’s blog. I’ve learned more from his blog then from my photography books! 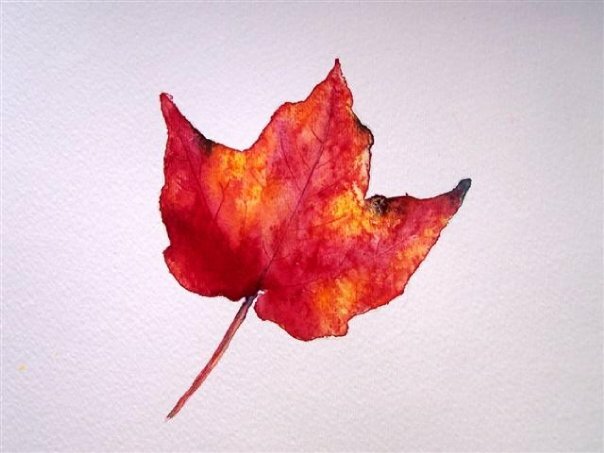 I, too, love autumn and the fall colors and your watercolor of the leaf. Didn’t know all those theories about Van Gogh, but I have been to the Van Gogh museum and I love his work. Listening to the Dutch pronounce his name sounds like that cat got stuck in their throats and they are trying to get the fur ball out! Also love both of your black and white minis. They are so decorative! Now I must meditate…llama, llama.llama, llama.llama, llama. Ah….I feel calmer already. Oooo.. I would love to go there. Especially in the spring when the tulips are up. Arg! I haven’t been getting my email notifications of the blogs I’m following. Wondered what everyone was doing! Okay, Munchow, I’m coming to pickup yours too! I’ve only been getting about half of mine, I’m not sure what’s up with that. Not only does your artistic talent continue to impress me your sense of humor brightens my day every time. To me, it mattered not that he may have been mad.I have been inspired by Van Gogh’s work over and over and never tired of it. What a packed post! 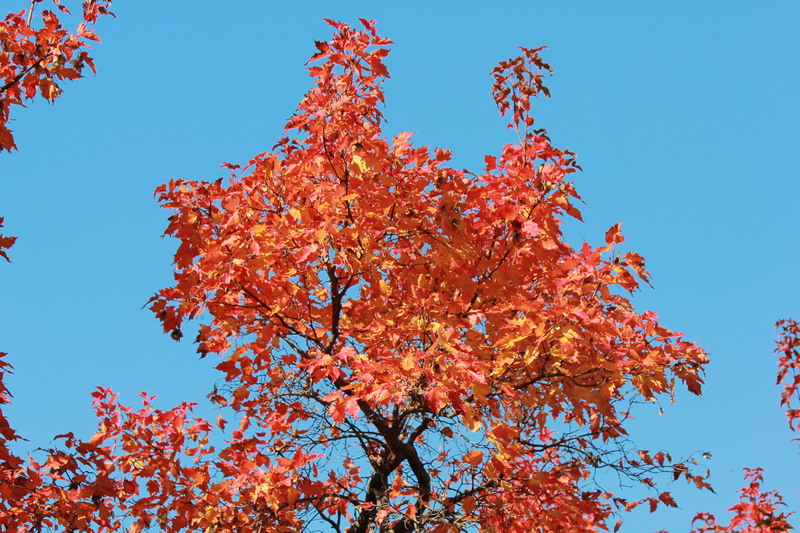 Your painted leaf pays honor to the tree. 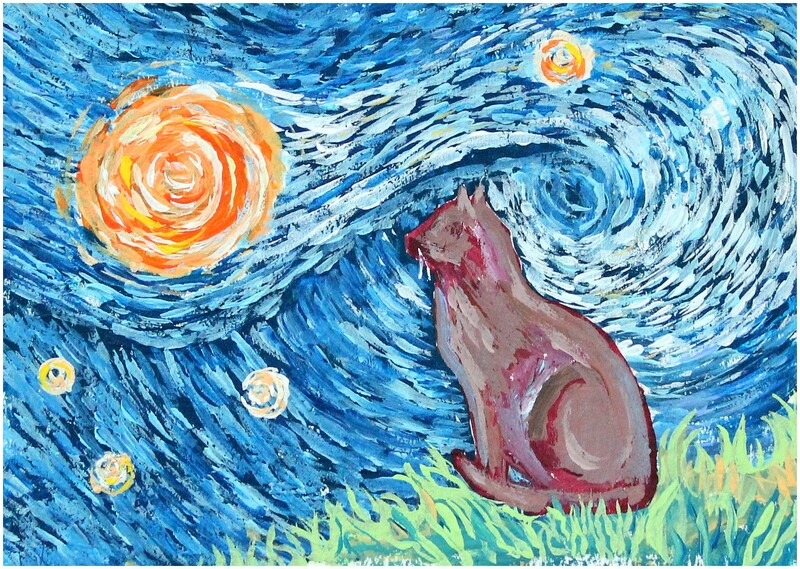 Your cat painting in impressionistic stylepays honor to Van Gogh and I LOVE YOUR Llama!